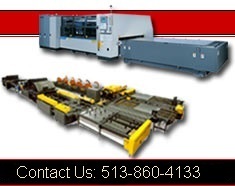 Press Brakes | Cincinnati Precision Machinery, Inc. Whether you bend plastic or steel, there’s a Betenbender Hydraulic Press Brake to match your needs, ranging from the 17-ton model to the 350-ton. No matter the size, each machine features convenient operation for maximum output and ease of maintenance for maximum productivity. When your name goes on the finished product, so does your reputation. Betenbender feel the same way. Compare features. Compare results. You can count on first-class American technology, rugged durability, versatility and economy when it’s manufactured by Betenbender. Use either a convenient multi-switch control panel or a 3-position fully guarded foot switch. Every Betenbender Press Brake Machine is thoroughly inspected and tested. Parallelism is maintained between bed and ram, or at a preset angle, by using precise automatic leveling controls. Parallelism is maintained at ± .002" in low speed. The side situated handwheel of the Betenbender Press Brake sets the bottom limit of the ram stroke. Micrometer adjustment on the control end allows for tilting or paralleling of the ram. A bed referenced control monitors the actual distance between ram and bed, assuring repeatability independent of die wear or end plate deflection. Betenbender’s Press Brakes have long, full tonnage stroke; adjustable length and selectable speed combinations; adjustable height for short stroke. A two-speed standard; three-speeds with infinitely adjustable low speed is optional. This option prevents sudden whip up of the work during bending operations. Clevis mounted cylinders eliminate cylinder binding by reducing the possibility of oil leaks. Pins and bushings do not rotate under load, resulting in much less wear than competitive products. The manifold assembly saves space and makes it easy to replace many components. The convenient work height makes the job easier. Readouts in increments of .001" allows recorded settings of closed heights. The control system components, micro switches, clamp-type backgauge, hydraulic fluid and filter cartridges are all standard equipment, making routine maintenance easier. 2-speed ram is electrically controlled. It lets you shift to a lower speed before coming into contact with sheet metal. The ram stops at the point of reference and self-levels at the bottom of every stroke. Main control cabinet enclosures are mounted in the right housing containing magnetic, non-reversing motor starter and 110/120 volt control circuit. The control system operates at 110/120 volt using a minimum of circuitry. The system operates predominantly with American made electronics and American made motors. 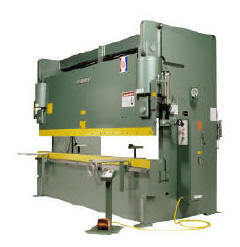 This Betenbender Press Brake has all-steel ends, rams and beds. Meets requirements of NFPA79. It includes drip proof, continuous duty 45º C ambient hydraulic pump motor wired for 230 or 460 volt, 3 phase, 60 hertz. Is accomplished by two hydraulic systems. One for each cylinder, which keeps them parallel. Self-levels at bottom of each stroke even if hydraulic system is out of adjustment.